The stock market was down, way down, see-sawing, way up, topsy turvy, way down and then up again last week. Stock futures were rising Monday morning. You probably have a ton of questions. We've got you covered. Well, first let's say: Markets function like a crowd of 45,000 people at a baseball game. It's impossible to know precisely what drives its movements. That said, it's possible to see patterns. Four reasons stand out for the current market madness: Investors are worried about inflation, higher interest rates, rising bond yields and an overheated stock market. The first three are all related. On February 2, the U.S. Labor Department reported that workers are getting much bigger paychecks than economists had expected. When companies pay their workers more, they usually raise prices to afford the higher labor costs. If prices start to rise too fast, the Federal Reserve will raise interest rates. When rates rise, companies have to pay more to borrow money. That makes them less profitable -- and their stocks less valuable. When prices rise, bonds become less attractive, because inflation eats away at bond investors' returns. When bond prices fall, their yields rise. Low bond yields had been fueling the stock market -- stocks are riskier investments but were almost guaranteed to return more to investors than bonds over the past year and a half. The U.S. Treasury will also be issuing more bonds to raise money for the recent tax cuts and budget deal, which will drive up deficits. A bond glut lowers bond prices and raises their rates. Rising yields are giving investors spooked about risk an excuse to get out of the stock market (and into bonds). Separately, some investors believe the stock market needed a breather. Stocks were starting to look pricey after rising nonstop since the November 2016 election. 2. What's so bad about high inflation and wages? What's good news on Main Street is sometimes bad news on Wall Street. Inflation has remained stubbornly and mysteriously low throughout the economic expansion that began in mid-2009. That has prevented the Fed from raising its interest rates. And that made borrowing money cheap, helping people buy homes and companies to boost profits. It also juiced stocks. Over the past year, inflation has begun to slowly creep higher, and the Fed has followed suit by gradually raising rates. 3. Why are bonds sending stocks lower? The bond market has been incredibly quiet and boring for more than a decade. Fearful investors poured money into government-issued bonds during the Great Recession, because they are a safe investment backed by the U.S. Treasury. Rates have remained low as the stock market roared higher. Wall Street investors figured stocks would keep rising as the economy kept expanding and companies continued to grow. Yet growing deficits and inflation fears sent the benchmark 10-year Treasury yield to a four-year high last week. It's still low, well below 3%, but creeping higher. If you're an investor worried about having too much exposure in the stock market, rising bond yields may start to pique your interest. 4. Why did the stock market need a breather? Stocks have been on a tear since 2009, but their run-up since the November 2016 election was historic. The S&P 500 hadn't fallen by as much as 3% between November 4, 2016, and February 1, 2018 -- a record streak of market calm. The VIX volatility index set a number of all-time lows during that stretch. Stocks got expensive. S&P 500 companies' stock prices traded more than 18 times higher than their earnings forecasts -- way above the 25-year average of 16-times earnings. The stock market was well overdue for a correction. Investors looking to enter the market like corrections, because it makes stock prices more affordable. This could be as good a buying opportunity as any. A correction is when stocks fall 10% from a recent high. Stocks aren't currently in a correction, but they're close. The Dow hit an all-time high of 26,616 on January 26, and it closed at 24,190 on Friday. That's 9% lower. Both the Dow and the S&P 500 were in a correction a few times during last week but ended the week just outside of correction territory. 6. Are computers part of the problem? Stocks are trading lower with good reason, but computers have been responsible for some of the incredible volatility last week. The Dow fell 800 points in 10 minutes on Monday. It opened lower on Tuesday but closed 567 points higher. The same thing happened Friday, with the Dow trading both 500 points lower and 500 points higher before closing up 330 points for the day. Computer algorithms figure out buying and selling opportunities, which leads to some of the roller coaster rides we've seen recently. When bond yields hit a certain target, computers might start selling. When stocks hit a certain low point, they could start buying again. 7. How bad is this, really? Last week was both unprecedented and totally normal. Stay with us. The Dow lost more than 1,000 points on Monday and Thursday. That had never happened before (let alone twice in the same week). The VIX volatility index, which tracks short-term market turbulence, jumped 116% on Monday — the highest daily percentage increase on record. 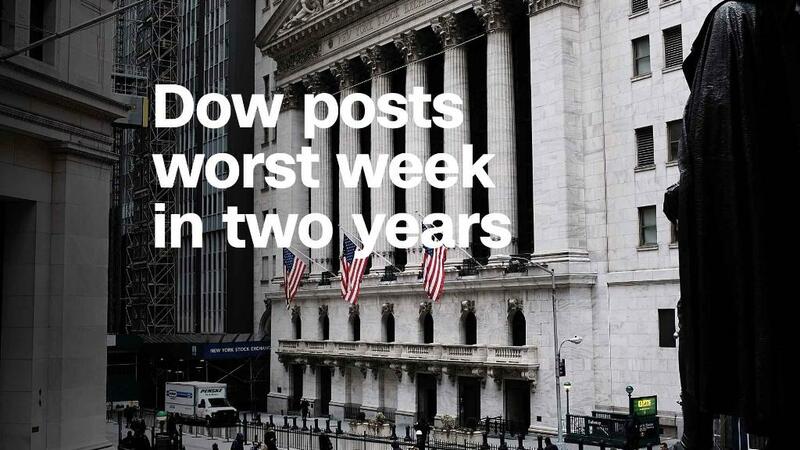 Okay, now for some important context: The Dow lost 5.2% last week. One week in January 2016 was even worse, and you probably have no memory of it. The Dow is still up 32% since the election and down just 9% from its all time-high. The stock market entered its first 10% correction in two years Thursday. Corrections are totally normal events, and the market was way overdue for one. 8. Does this mean we're in a recession? The stock market is not the economy. Stocks don't cause economic downturns, and the market is a historically lousy predictor of recessions. One reason the stock market fell last week is that the economy is doing so well. Super-low unemployment and healthy economic growth are great for workers, but investors are getting worried about a byproduct of strong economies: inflation. 9. Has Washington caused this? Politics and policymakers have played a role in the stock market, for good and bad. Years of low interest rates in the beginning of the century created a housing market bubble, which burst during the Great Recession. The Fed responded by lowering rates to near zero for nearly a decade, creating an era of super-cheap borrowing and free spending. Political gridlock during the last six years of the Obama administration exacerbated the stock market's rise. It meant that Congress was unlikely to pass new regulations. The Obama administration still enacted regulation, a lot of which business didn't like. Then a Republican-controled Congress and White House came in with a deregulation/tax cut agenda and sent stocks up even more. But that giant tax cut and a recent budget deal will also add to the deficits. The Treasury needs to borrow money to cover a wider gap between the government's revenue and expenses -- in the form of bonds. Yields are rising, stocks are falling. So, yeah, Washington is to blame at least somewhat. 10. What does the president have to say? President Donald Trump has tweeted about the stock market dozens of times, taking credit for its incredible run since his election. Yet he has been much quieter on Twitter about the market since it started to tumble. In the "old days," when good news was reported, the Stock Market would go up. Today, when good news is reported, the Stock Market goes down. Big mistake, and we have so much good (great) news about the economy! Stocks are a dangerous political billboard. They aren't a reliable barometer of good times. For instance, when investors fear that a strong economy could lead the Fed to raise rates, good news has sent stocks lower in the past. And bad economic reports have sent stocks higher for the opposite reason. Plus, millions of Americans aren't invested in stocks. 11. What's happening to stocks in the rest of the world? Market turmoil is actually worse in some overseas markets. The Shanghai Composite is down nearly 15% from its January peak. Hong Kong's Hang Seng fell 13% over the past few weeks. Stocks are down 16% in Argentina, 13% in Japan, 12% in Germany and 11% in South Africa. What does U.S. inflation have to do with global stocks? Not much, except investors had little appetite for risk last week. U.S. stocks often lead other markets up or down. 12. Should I get out now? Losing money stinks, but a buy-and-hold strategy is the best way to make money over the long haul. If fear drives your buying and selling decisions, there's a risk you will sell when the market's at the bottom and buy when it's at the top. Investors like corrections because they make stock prices more affordable. This could be as good a buying opportunity as any. And if you're properly diversified, your portfolio might not have taken such a big hit anyway. Diversified? Yes, that means if you're young, you're in an especially good position to buy low. If you're nearing retirement age, you might have already started to replace your stocks with other investments. 13. How long will this last? It could take a little while for markets to settle down. It's hard to say. But the fundamental underpinnings of the stock market remain strong. Corporate profits continue to rise, and they'll likely grow even bigger after companies start to realize the benefits of the new, lower corporate tax rates that kick in this year. The economy is expected to grow strong this quarter, and inflation is still quite low. Taken together, that's a recipe for rising stocks. That doesn't mean they'll continue to rise in a straight line. But most Wall Street analysts believe this just a temporary pullback. -- CNN's Julia Horowitz, Matt Egan, Danielle Wiener-Bronner, Chris Isidore, Alanna Petroff, Daniel Shane and Jethro Mullen contributed to this report.